1. 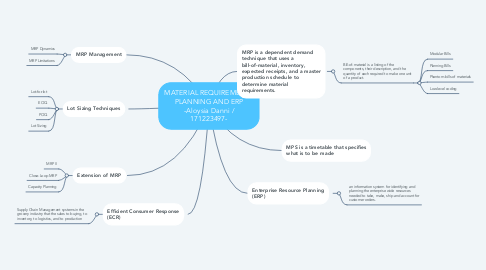 MRP is a dependent demand technique that uses a bill-of-material, inventory, expected receipts, and a master production schedule to determine material requirements. 1.1. Bill-of-material is a listing of the components, their description, and the quantity of each required to make one unit of a product. 6.1. an information system for identifying and planning the enterprise wide resources needed to take, make, ship and account for customer orders.